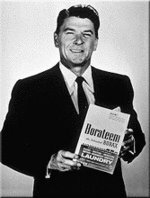 + I'm not exactly sure how I ended up on a page about Borax but it had this public domain image of Ronald Reagan selling the stuff. And perhaps it's my frame of mind (silly) from the project I'm working (trying very hard to focus) on, but I found it somewhat amusing. I need more sleep and more caffeine I think.